Looking for a quick fast loan? How do you determine what is best for you? There are many options to get cash into your checking account over night. They vary by price, term, and security. We review five different options and provide the pricing, terms, and examples for when they might be best used. Our research found five types of quick fast loans. We define fast cash loans as loans that provide cash in less than 24 hours and are repaid in 14 days. We then evaluated these five types of loans based on cost and lender requirements. The result of our analysis is that overdrawing your checking account is the most expensive option while taking out a credit card cash advance is the least expensive. The options that fall in between are pawn loans, payday loans, and title loans. Pawn and title loans require collateral such as a paid-off vehicle. Payday loans do not require collateral but do require a checking account and a job. 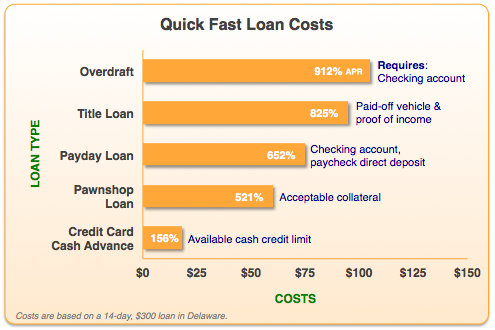 The following chart summarizes the five types of quick fast loans. We includes estimated costs and lender requirements for each type of fast loan. The following sections describe each loan option in more detail and for whom each option is a good pick. Credit card cash advances are the lowest cost option but require that you have a credit card with available cash credit limit. They are not a good quick fast loan option if you do not have an existing credit card, as it takes at least 10-14 days to apply and receive a card. Pawn loans are the second lowest cost option. To get a pawn loan, you need collateral, which means that if you are unable to pay your loan and interest back, you risk losing an item worth more than the loan you took out. Pawn loans are not the best choice if you do not have any items to pawn. Since pawn loans require turning in your collateral items, they are generally done in person in a pawnshop. Aside from the local pawnshops near you, you can locate stores of larger chains, such as Cash America, through their online store locator. Payday loans are the third lowest cost option. They do not require collateral or a credit card, making them the best quick fast loan option if you have poor or no credit, do not have a credit card, need a loan for more than a week, or are not willing to provide collateral. Payday lenders do require a steady source of income and a checking account with direct-deposited paychecks. If you meet the requirements for a payday loan, our top picks are Check into Cash, Ace Cash Advance, or Check City. For loans more than three months, our choice is installment loans. These loans are also underwritten based on your paycheck and have the same requirements as payday loans but have a longer payment term. Our most popular installment loan lender is Net Credit. Title loans were the second most expensive options for quik cash loans. To take out a title loan, you must own a vehicle that has been fully paid off and with a value more than the loan you are borrowing. While you can use your car when you take out your loan, your car will be used as collateral, and if you do not pay off your loan, you risk losing your car to the lender. Title loans are better for larger loan amounts generally over $1,500 and to meet longer term needs. Most of the time, payment periods are a month or more, meaning your loan is subject to monthly interest rates even if you repay your loan earlier. In addition, there is a state titling fee. If you meet the requirements, are unable to take out other long term loans, need a larger loan for more than a month, then title loans are a viable option. Consider 1-800LoanMart or one of its partners to see if title loans are right for you. While not an obvious option, overdrawing your checking account is much like taking a quick fast loan from your bank account. Due to high overdraft fees, this was our highest cost option. If you do plan to overdraft, we found that costs can be greatly reduced if you overdraft no more than one check at a time and do not exceed the number of days your bank has set before it starts charging overdraft extension fees. Bank of America, for example, charges $35 for one overdraft and another $35 if your negative balance is not paid within 5 consecutive days. If you do not have a checking account and are interested in signing up for one, we like USAA (especially if you are a military personnel, but also if you are a non-military personnel) for its lack of monthly service fees and free nationwide ATM withdrawals from any other banks (limited to the first 10 transactions). If you’d prefer something more mainstream, try PNC Bank’s Free Checking product for its lack of monthly fees, debit card fees, minimum balance, and direct deposit requirements. The Payday Hound reviews installment lenders and ranks them according to our Sniff Test (reputation), costs, and licensing. To see lenders in your state select your state from the table above.